So as per the definition it is nothing but signing on to different application only once. I have selected THREE REAL TIME EXAMPLES in places where I have used SSO in our projects with their architectural details. For all the three method below, concept is only one, multiple applications are signed with a mechanism where the authentication are persisted and maintained. This type of SSO is only done for application which is very light weight and mostly it is an intranet application that exists in same domain. In the above example the URL is the same and only app differs. Easy way to configure SSO in two applications is using Machine configuration file. 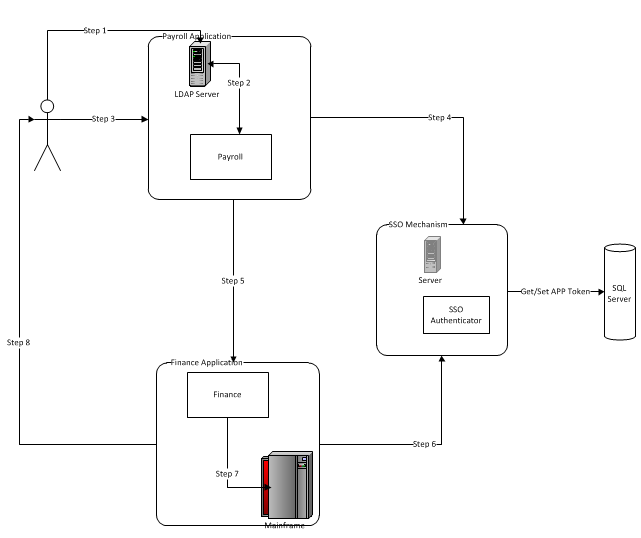 If we have an intranet application and we want them to be SSO enabled then Machine config should suffice. You need to add entry in both application’s web.config and make sure both the authentication mode are same and also the numbers of parameters in the web.config are equal. Once the configuration is done the session is shared and the cookies are also accessible by both the application and you can access one application to another. Create a two websites with login page that has a login usercontrol that accepts user name and password. Build the application and you are done. To test the application add the link of the first application to the second application and add the second application to the first application. Try navigating to the First application, to ask for user name and password. Try navigating to second application, it will ask for user name and password. But if you have logged into either of the application, the other application will not ask for user name and password. With the above Config settings in WEB.Config, the .NET framework uses the automatically generated validationKey and decryptionKey to create an authentication ticket and cookie. Each application uses different keys. To make multiple applications to share the same authentication ticket and cookie, we just need to set the validationKey and decrytionKey in all the applications to the same values. In the URL’s above the organization is same but departments are different (Finance and Payroll), so we might have a different user name for accessing the sites. This type of different application for different department is common in many companies which has less employ strength. Above code changes the domain of the application to have a common second level domain. Changing the domain to common “XyzCompany.com” will make the two application Finance.XyzCompany.com and Payroll.XyzCompany.com logged in at the same time. In above example the domain is different, so they cannot use any of the above two methods. 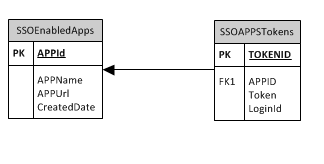 We need to come up with different method where we have to implement some logic in both party to support the SSO login. Step1: First the user logs in to the Payroll application. Step2: Payroll application is authenticated by LDAP and once the authentication is successful the application takes the user to payroll’s main page. Step3: User want to access the finance application through the finance application link available in the main page of the payroll application. Payroll application will call the SSOAuthenticator to get the token that will be sent to the finance application for authentication as a query string. SSOAuthenticator saves the token in the common SSO Database with the login information that has been provided by the payroll application. Step4: Payroll application will navigate the user to SSOLogon.aspx of the finance application with the token got from the SSOAuthenticator as a query string. Step5: Once the SSOLogon.aspx page is accessed the page will then use token to validate the request, any malformation of the token or any tampering will deny the access to the finance application. Step6: Finance application will then use the token that was send by the payroll application to get the data of the login user. Step7: SSOAuthenticator takes the token id and will search in the SSO database and retrieve the token’s corresponding information such as login id, that is used by the user to login and all the relevant login information will be send to the user. It also deletes the token id from the database to avoid misuse of the token by other systems. 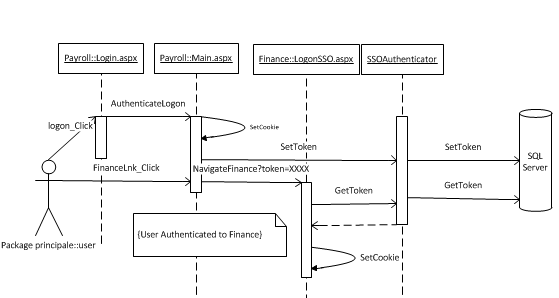 Step8: Once the data from SSOAuthenticator is valid then the finance application sets it cookies to the login id got from the user and validates the authentication in the mainframe database of the finance. Cookies are set in the finance application for access. Step9: User is navigated to the main page of finance application. For simplification I have added only two tables which will be used in implementing the database details. SSOEnabledApps table is used to store the application details where SSO is implemented, APP id acts as the identifier of the Application. SSOAppsTokens table is used to store the SSO Token id with the application id which will be used for SSO login purpose. · Sooner or later Data becomes out of sync. · Changes occurring in our database cannot be transferred to the SSO database until the next scheduled run. Therefore, the third party database is not up to date. · There is a need to create a different data transfer mechanism for each SSO database due to different business requirements. It is difficult to manage the multiple data sync processes.